Learn the best way to defeat the Blazing Bull boss fight in Sekiro: Shadows Die Twice with the use of firecrackers and good strategy. 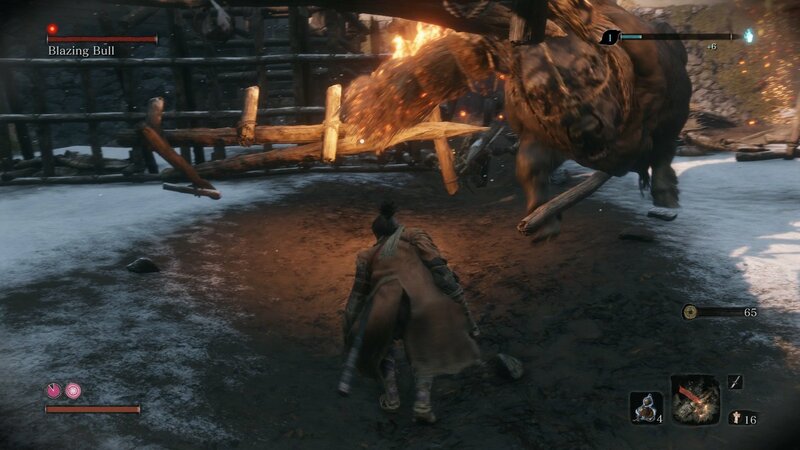 The Blazing Bull boss fight in Sekiro: Shadows Die Twice is challenging if only because of its speed and huge health bar. Through correct prosthetic tools and good positioning, the Blazing Bull fight becomes a test of patience. The Blazing Bull boss fight is all about hitting the boss once or twice and then running laps. Thankfully, this boss requires a single deathblow, making it exceptionally easy. The difficulty will be in avoiding its attacks and just trying to keep up with how quickly it runs around the arena. As far as the Blazing Bull’s posture goes, it regenerates extremely quickly. The key to this fight is getting its health down low and then building up the posture damage. Alternatively, reducing the vitality to zero will instantly fill the posture meter, granting a quick kill. By sneaking in, the Blazing Bull boss will take out the two guards on the othe side of the fence, all you have to do is stealth deathblow the one near the entrance. Start the Blazing Bull fight by sneaking in and performing a stealth deathblow on the unsuspecting soldier. Stealth forward to activate the fight and be sure to stay hidden from the soldiers. If done correctly, they won’t run away and will instead be killed by the Blazing Bull. Once the bull starts charging, follow it around the arena as it destroys everything in its path. The goal will be to keep up with it and score hits when it slows down. Whenever the bull reaches a wall or comes to the end of a sprint, it will slam one of its horns into the ground and pivot. During this animation, you will want to score one or two hits. You want to avoid situations where you are directly in front of the Blazing Bull. If you find yourself face-to-face, try and get to its side and then behind it. Most of its front-on attacks will slowly build up the fire status, which when filled, will constantly reduce your health. If you find yourself head-on with the bull, guard its attacks (or try and deflect) and move around to the side. Most of the fight will look like you two are chasing each other. Wait for it to tire or do its horn-in-the-ground turn-around move and dive in for an attack. The most important tool for this fight is the Shinobi Firecracker prosthetic tool. The firecrackers stun the Blazing Bull, allowing you to deal a lot of damage while it freaks out. Because Spirit Emblems cost sen, it can be worth saving the firecrackers until the bull is at half health. By the time the Blazing Bull is almost dead, you should be confident knowing that you can finish the fight, and the firecrackers will help push it over the line. When the Blazing Bull gets to 5 or 10 percent health, it will start going wild. It will become even more frantic, bucking and thrashing all around the arena. Try and attack it where possible to continue getting its health down lower. However, there’s a chance it could run into a wall and become stunned, allowing for a swift deathblow. 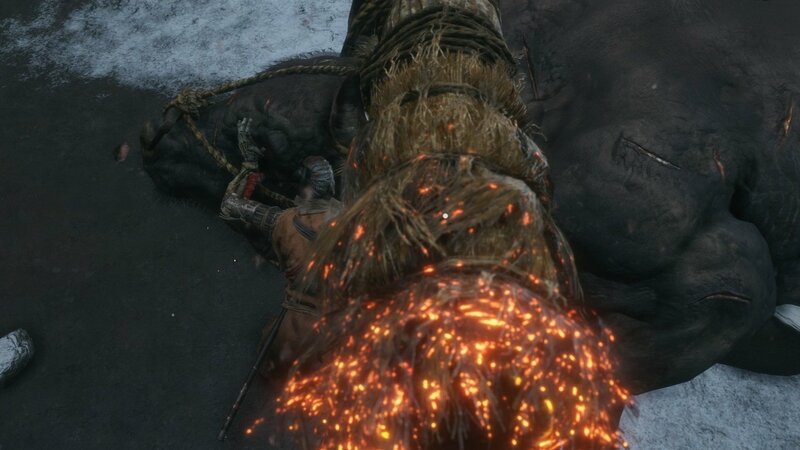 The Blazing Bull boss fight in Sekiro: Shadows Die Twice is one of the first fights where the rules seem to change. Unlike the Lady Butterfly fight where patience and precision rules, the fight against the bull is a little more hectic and frantic. Be sure to check out the Shacknews Sekiro: Shadows Die Twice page for more guides!